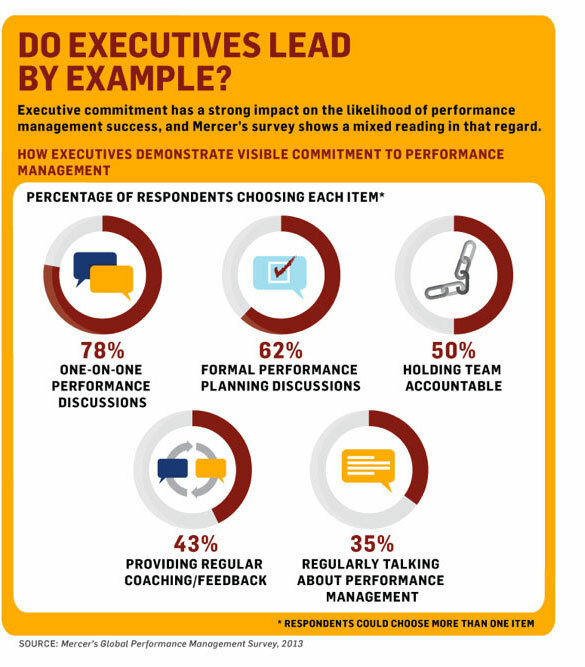 What has the greatest impact on COMPANY PERFORMANCE? 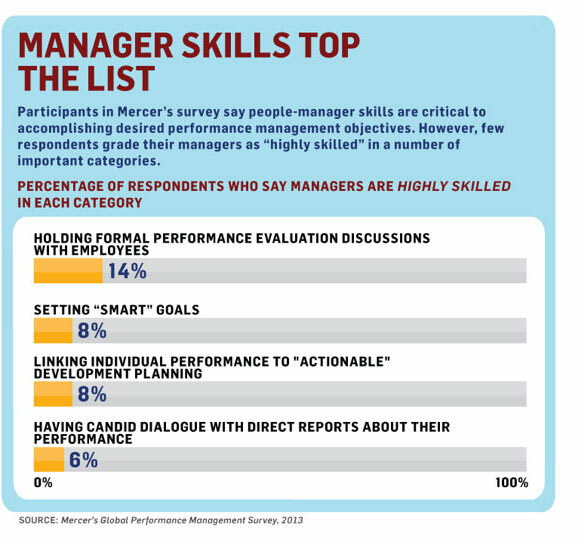 The 2013 Mercer Global Performance Management Survey reported that one in three organizations said the ability of managers and employees to engage in performance conversations is key and has the greatest impact on company performance, and that performance management initiatives could and should be more effective. Only 3% of the 1,050 survey participants from 53 countries say their performance management program provides exceptional value. THE BIGGEST PROBLEM: ONLY 6% OF MANAGERS ARE HIGHLY SKILLED AT HAVING CANDID PERFORMANCE CONVERSATIONS. The skills required to give and receive effective, non-threatening feedback require specific training in simple, proven processes that have now become the preferred alternative to the standard annual performance review. There is little point in revisiting traditional performance management processes hoping for improvement while focusing on forms, processes, ratings schemes, competency models and automation technology, when most managers lack the skills to optimize performance through insightful feedback. Performance management is about the conversations eleven months before and after the annual performance review, but just telling managers to improve, or even have, performance conversations won’t make it happen. Most employees and managers talk regularly about job responsibilities, project status, goals and a variety of work issues. Typically, this happens in-person, by phone, email, or text, in the car driving to meetings, through open door practices, and while having lunch. Most employees are dying for feedback yet have given up asking for it. That’s because commonly-asked, simple questions beget unhelpful, non-specific answers. So, inevitably, employees give up seeking real feedback. These conversations often go like this: How am I doing? You’re doing great; or, How’s it going? Everything’s good; or, Are you having fun? Yes, it’s all good; or, Can I do anything better? I can’t think of anything. It is standard practice for managers to periodically and formally meet with employees to review project goals, status reports, work challenges, and to discuss new ideas. These one-to-one meetings are valued by employees who appreciate managers taking the time to focus on them. However, they often represent missed opportunities for both managers and employees, since they seldom include higher-level conversations about performance.